After a phenomenal last few games that saw Mourinho and his team edge past Brighton and Watford on the road and then notch up crucial victories against Arsenal and CSKA Moscow at home, the Red Devils could not have asked for a better preparation leading up to the Manchester derby. A clash between two of the shrewdest tactical masterminds of the game, would therefore involve some mind games. Pep Guardiola has claimed that David Silva is a doubtful starter for the Manchester derby this weekend. His claims are backed by the fact that Silva has been left out of the travelling squad to Ukraine for their final Champions League group game against Shakhtar Donetsk. Guardiola came out to the news conference and insisted that David Silva may not be match-fit for the clash of the Mancunian heavyweights. The United boss, however, believes that these are mind games that are being played by Guardiola. This comes after Arsene Wenger played his French summer signing Alexandre Lacazette in Saturday’s clash after previously ruling him out for selection. Jose then reiterated that he only spoke the truth where a player like Matic will play even with an injury, unlike the stories of David Silva and Alexandre Lacazette. Without picking out the name of any particular opponent, Mourinho spoke that his opponents only have injury problems leading up to the clash but when then, come match day, everyone is ready to play. Therefore, he reminded the media that he does not have any new injuries to the squad, unlike his fancied opponent and that is the truth. The Mancunian derby this weekend is indeed hyped given the eight-point gap between the city rivals. Pep and Mourinho have also been traditional rivals be it the La Liga then, or the Premier League now. 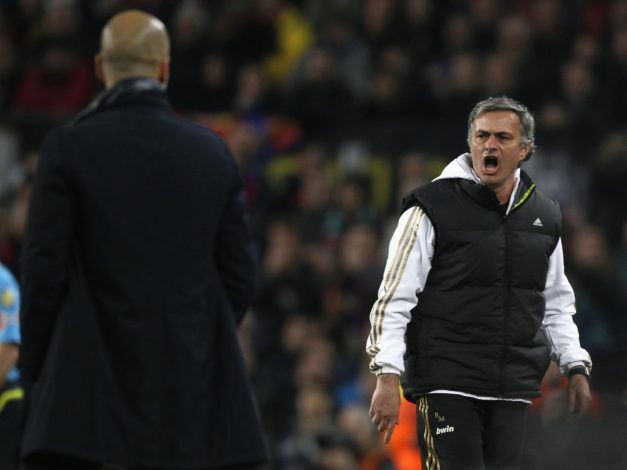 Besides, Pep holds a lopsided record in his favour in the head-to-head battle with Mourinho. Therefore, the United boss will leave no stone unturned to hold his counterpart to each of his words. Silva’s presence in City’s lineup will be crucial given the skill and experience he brings to the table. For Mourinho and his men, the task is cut out. They will need maximum points from this game to stand any chance of being title contenders. Anything otherwise would surely open up a huge gap at the top. United, who would be without the services of Pogba, would rather wish for Silva’s absence. One thing that United need to be wary about is the fact that City have recently come-from-behind wins in their hand, where they have had a tendency to score late in the match. United have a relatively easy set of fixtures rest of December, except for a tricky home game against Burnley.